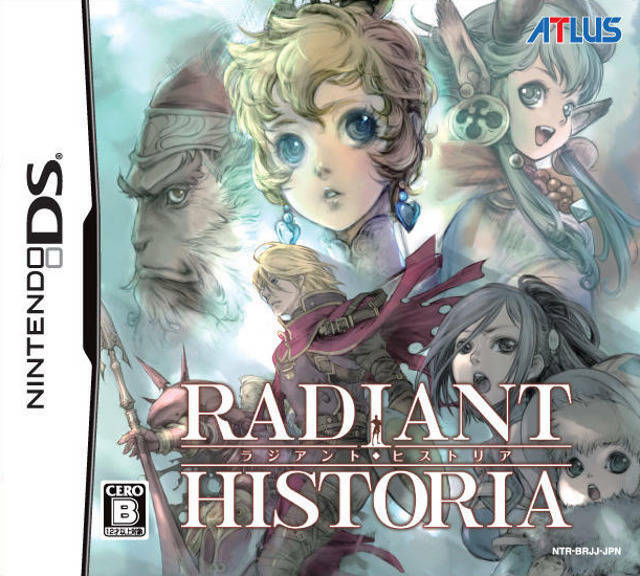 Radiant Historia is a game developed and published by Atlus. It came out in 2011 and never saw a PAL release, but thankfully the old DS systems are region-free, so I could play it with no problem. My copy came in three months ago, courtesy of my good friend Jonathan. It follows the story of a young man named Stocke, a former member of the Alistel army now working in Special Intelligence (or Specint for short). Early in the game Stocke is given the White Chronicle, a mysterious book that allows him to travel between different points in time from Historia. Historia is a place which exists outside of time and is peopled by just two guardians, who are to guide the wielder of the White Chronicle throughout their journey. Stock must utilise the White Chronicle if he is to stop the desertification of the land of Vainqueur, else the entire continent will be swallowed by sand. Not all, but some time nodes can be revisited at will from Historia, which can be accessed via the world map or through save points. Early on in the game, Stocke is presented with a choice by his best friend Rosch, and this creates the very first node. He can either return to the Alistel army with Rosch, or stay in Specint. 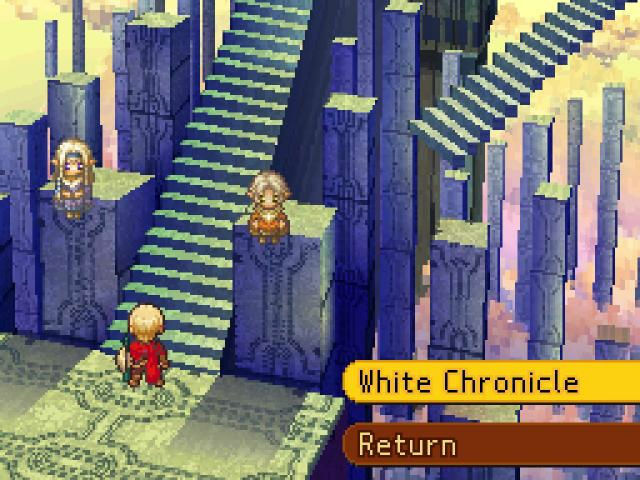 This causes a timeline divergence, and the game’s plot sees you playing out both scenarios using the power of the White Chronicle. This is Historia. The two floating above Stocke are his guides. All of the jumping through time is done without the knowledge of any of Stocke’s friends; he is ultimately alone in his journey. The party members at your disposal change around frequently as a result, depending on which timeline you’re in and at what point in that timeline you are. And they do not level up in your absence. This can be mildly irritating at times, but I never felt it was a major drawback, as they always caught up pretty quickly. I adored all of the characters in this game. They were wonderfully developed throughout the entire story. It was refreshing having a main character who wasn’t angry or cocky, and who was instead practical, level-headed and very down to Earth. Best of all, they all very much felt like they could be real, average people who just so happen to be caught up in this war. It’s not something easily done, but Radiant Historia has managed to, and has done so beautifully. This trio of enemies is about to be pulled to the front line, as indicated by the red arrows. 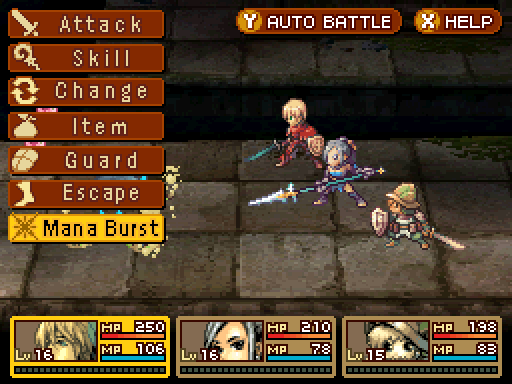 The battle system in Radiant Historia is one of my favourite things about the game. Enemies are placed on a 3×3 grid; basic enemies take up one space, while some larger ones may take up multiple. The interesting part is that enemies can be pushed to different parts of the grid using certain attacks, and this is a large part of the battle mechanics. For example, enemies on the back line deal less damage, but also take less damage, while those on the front line deal and take more. You can also push enemies into each other, which allows you to damage multiple enemies who are standing on the same square. To make matters even more complicated, there’s a combo system to take into account as well. The more you attack one enemy or a group of enemies, the bigger the combo gets and the more damage you do with each hit. You can also increase combos by alternating attack types. If, say, your first strike was a physical move, following up with a magical attack will result in a larger combo than if you used another physical one. In addition, there’s a bar on the left-hand side of the screen which shows who will be making the next ten moves, and in which order. There’s a way to make an enemy turn disappear, and also an option on the battle screen to “Change”, which lets you swap the current character’s turn with someone else’s, or even an enemy’s. Doing so allows for greater flexibility, but the character that swapped out will experience a defence drop until they take their next action. The battle menu, with the (empty) Mana Burst bars sitting beneath the below MP bar. Other options on the battle menu include your standard attack, using skills which you learn as you level up, using an item, guarding, escaping and using up your Mana Burst bar. The Mana Burst bar for each character fills as they attack and as they take damage. When it’s full, they get an option to use a Mana Burst attack. Each character gets three of these attacks, which they gain as you advance the story. One of these is Turn Break, which was mentioned above as an attack which destroys a single enemy’s turn. The other two are unique to each character. The party explores Vainqueur via the world map. It starts off being covered in clouds, which disappear as you progress through the game and unlock new areas. The world map allows you to travel between places on the continent that are currently available; the ones you can access change between time periods and timelines. 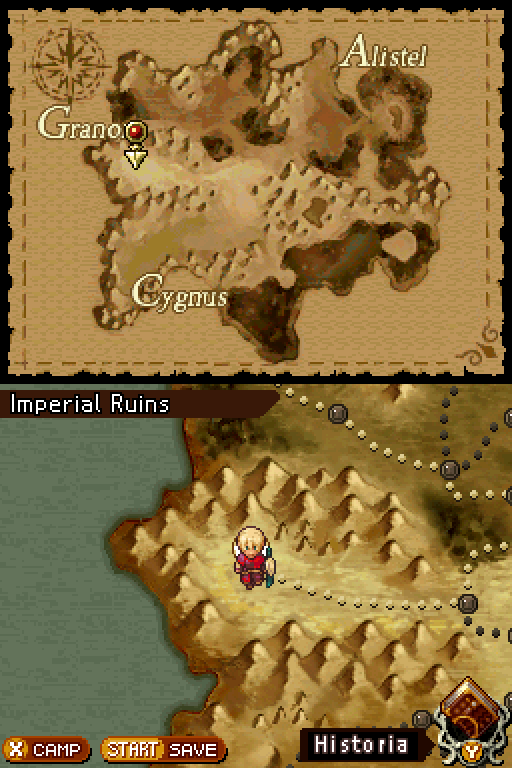 From the world map, you also can save the game and access Historia. Similarly, when you run into a save point in the field, you can choose to head to Historia, save, and even completely heal your party using a Mana Shard. The soundtrack to this game was a highlight for me, which is not something I can say that often. The battle themes were my favourites, and I’ve found myself listening to a number of them while I study. The game looked as good as it sounded, with a vibrant palette of colours and a charming art style. It was always a joy to play. I clocked up some 42 hours before I finished Radiant Historia; I spent just over 30 getting to the final boss and then ran around doing sidequests for another 10. A lot of these sidequests require Stocke to jump through time, were a lot of fun and were very rewarding. There are a few to do in this game, and they’re certainly worth doing as many of them unlock endgame cutscenes. Getting all of these cutscenes will allow you to see the game’s true ending. 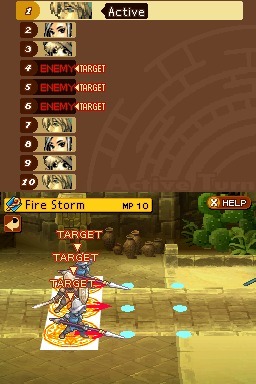 Radiant Historia is an outstanding DS game that Atlus absolutely nailed in every way. 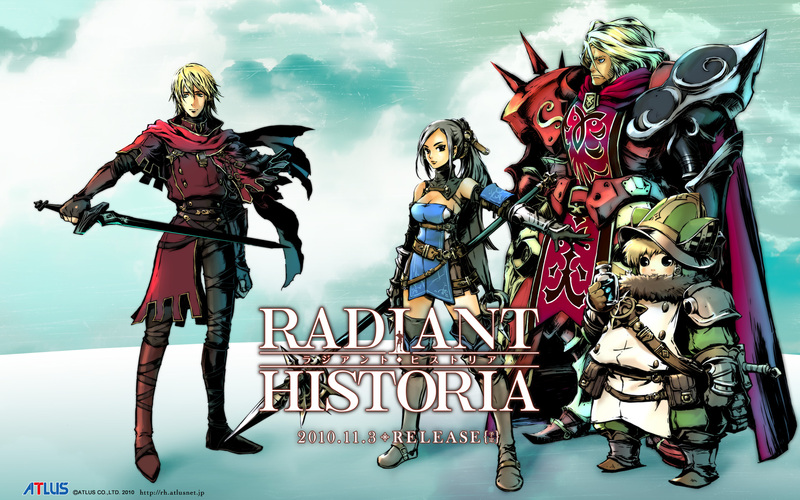 From the visuals to the plot to the music to the gameplay, and even the characters, Radiant Historia is an absolute masterpiece. Thinking about picking it up? Run, don’t walk.